The trend towards further consolidation in the European coatings sector is not just being confined to producers of finished coatings but to the manufacturers of raw materials as well, particularly additives. 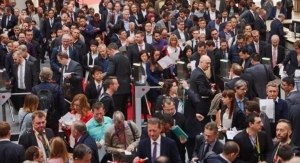 This was evident at last month’s (April) European Coatings Show (ECS) in Nuremberg, Germany, the world biggest international coatings exhibition which had a record attendance of over 30,000 visitors. A strong presence was displayed at the event by some leading chemical companies which have been expanding into coatings additives and other raw materials. Also some non-European players in the global coatings raw materials market were taking greater exhibition space or were participating for the first time as part of a strategy to gain a bigger foothold in a slow growing but large and stable market. 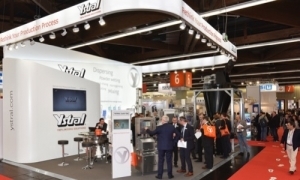 Another feature of the show were signs that producers normally confined to particular segments like pigments or resins were moving into related areas in the European coatings supply chain. A major impetus behind these changes is the desire among raw materials producers in Europe to become a one-stop source of supplies in certain parts of the European market so that they can gain greater influence over the product development in finished coatings. Among the other drivers have been a need for new technologies in the face of a rising demand for functional coatings, tighter environmental regulations, the growing switch from solvent to waterborne products in industrial coatings and increased use of biomaterials. Also there is a greater demand from end-users for higher performance coatings which requires the development of more sophisticated technologies. As a result coatings producers are having to provide to their customers more tailored products, often with specific functional properties. “Traditional coatings properties are no longer enough,” said Daniel Bruenink, director global marketing, decorative coatings at Evonik Industries, the leading German speciality chemicals producer, now a major player in coatings raw materials, especially additives. “Our customers are seeking to gain an advantage by imbuing their coatings with additional functionality,” he added. The larger chemical companies are well positioned to meet the needs of these customers because of their R&D capabilities. Evonik, which has a strong R&D competence, was among the most visible of participants at ECS with a large exhibition stand and a high profile in new product presentations and at the show’s conference. Earlier this year it completed the acquisition of Air Products’ Performance Materials division which transformed it into one of the world’s leading suppliers of coatings additives with approximately €2 billion ( $2 billion) in sales, equivalent to about 17 percent of the company’s total sales. The ECS was an opportunity for the company’s newly formed coatings additives business line to unveil its new portfolio for the coatings and adhesives industry. “We have here a unit with a technology platform that is unique worldwide, offering solutions for almost any challenge in the formulation of paints and coatings,” claimed Claus Rettig, chairman of Evonik’s Resource Efficiency segment. In the coatings area, Evonik is now a global leader in water-based additives, high-performance additives, curing agents, rheological additives and matting agents. 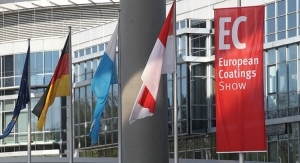 Among the new products introduced at the ECS was a compatibilizer which stabilises both organic and inorganic pigments in alkyd resin coatings. Evonik also showed new polyetheretherketone (PEEK) powers which reduce wear on industrial components in applications with demanding mechanical, thermal and chemical requirements. Another innovation was an easy-to-disperse silica product which during the production of coatings ensures shorter processing and cleaning times and less waste. Among other multinational chemical companies which produce coatings raw materials and were prominent in the show were Dow Chemical, BASF, Clariant, Solvay, Lubrizol, Arkema and Lanxess. 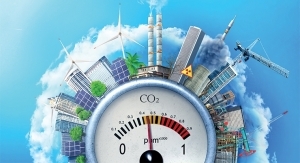 Dow emphasised materials for adding functionalities to architectural coatings, such as low odor, ease of cleaning and improvements to air quality through near-zero emissions of volatile organic compounds (VOCs). Among the non-European additives producers making their first appearance at the ECS was Songwon Industrial Group of South Korea which is the world’s second largest manufacturer of polymer stabilisers behind BASF. The company introduced at the show a range of antioxidants, UV stabilizers and hindered amine light stabilizers (HALS). A number of leading international chemical companies, like BASF, Clariant and Lanxess gave prominence to their pigments and dispersions portfolios, but also highlighted materials and additives in other areas. Clariant even launched a bioproduct – a sugar-based VOC-free neutralizing agent. 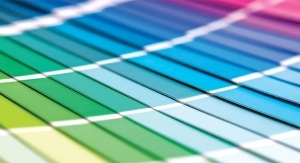 Merck KGaA, Darmstadt, Germany, a leader in special effects pigments, introduced a number of other products resulting from a move into materials for functional coatings. Among these were polysilazanes, a new class of coating binder based on a silicon polymer technology now proprietary to Merck following the $2.5 billion acquisition two years ago of AZ Electronic Materials, a UK–listed company making high-purity speciality chemicals for the electronics market. The takeover was aimed at using AZ’s electronic chemicals to expand Merck’s speciality chemicals division. “Because of its focus on electronic chemicals AZ did not see the tremendous prospects in this polymer which after curing becomes a highly durable, resistant and transparent ceramic-type material,” explained Oliver Piening, director global marketing technical functionals at Merck. Merck believes that with its high level of thermal, corrosion and scratch resistance, high hardness, hydrophobicity and applicability in low to medium thicknesses it has a great potential as a binder in transportation, architectural and industrial coatings. A major expansion in polysilazanes production capacity would be a big diversification for Merck in its coatings business but is illustrative of the new horizons being explored by Europe’s raw materials producers.